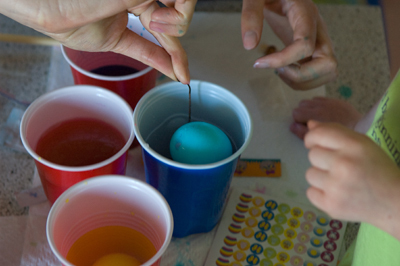 We had fun dyeing some easter eggs tonight. 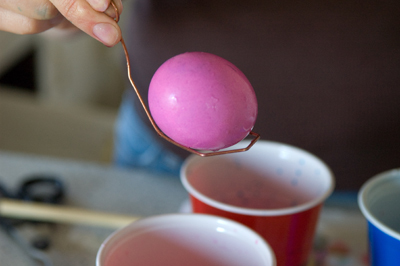 It all started out very carefully dipping one egg in at a time. We had beautiful colors like pink, purple, orange and green. 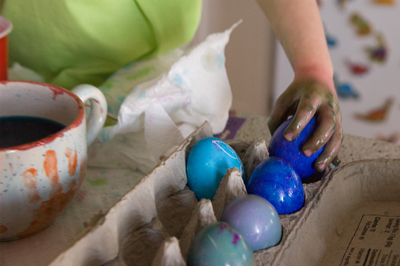 But in the end, all the eggs were dipped in to every color. Miraculously, they turned lovely shades of blue rather than the brown I remember them turning when I was a kid. 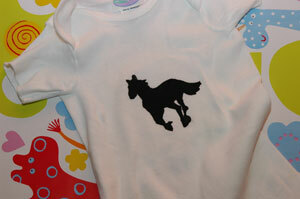 A little horsey freezer paper stencil t shirt for a sweet birthday boy. Horse image from Stencilry. I finally made a freezer paper stencil shirt for Johnnie and I love it! 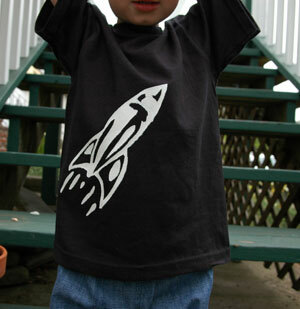 I got this black shirt and fabric paint at Dharma Trading and the stencil is from Stencilry. So much fun, I have plans for more soon--maybe with this one next. Johnnie loves dinosaurs right now. 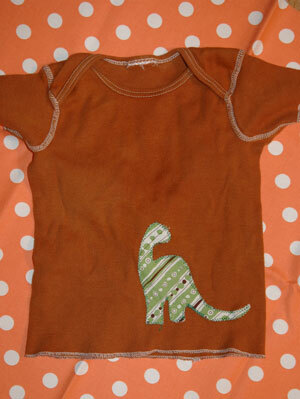 I made him this cute little dinosaur t-shirt using fusible web. I found the dinosaur image at Stencilry. I zigzag stitched around the dinosaur to secure the edges but I've made these shirts before without stitching and they seems to stay in place pretty well. I hand dyed this shirt a while ago with some friends. 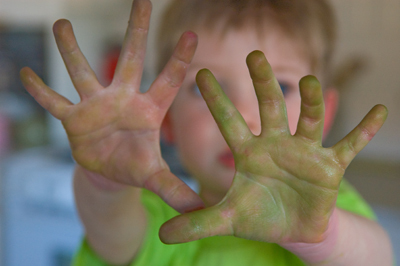 We have had a couple of "dyeing nights" where we dye clothing in 10 gallon buckets and make our kids entire new wardrobes. We buy the fiber reactive dye and all the clothing blanks at Dharma Trading Company. It's really fun and the next time we do it I'll be sure to snap some pics and share more info on it. 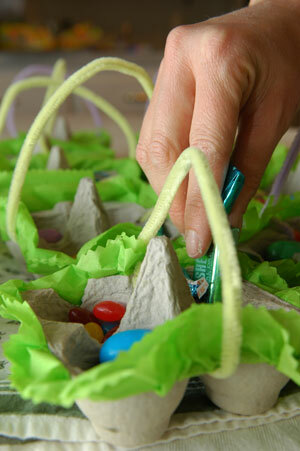 I've been saving up egg cartons for weeks after seeing a basket similar to this in the Martha Stewart Living Easter issue. 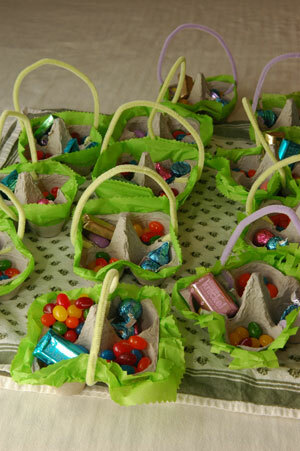 We are having brunch and an easter egg hunt at our place tomorrow and everyone will go home with one of these little baskets. 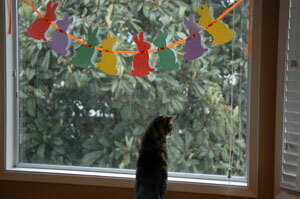 Johnnie and I had fun cutting out and stringing up this bunny garland today. I got the bunny template from here. 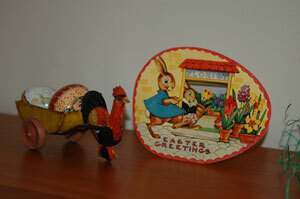 I love vintage look Easter decorations! 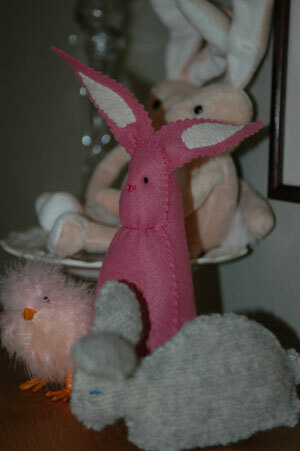 I made the pink and the gray bunnies shown here. The gray bunny was just finished today at our Waldorf class. I hope to finish a few more bunnies before Easter!